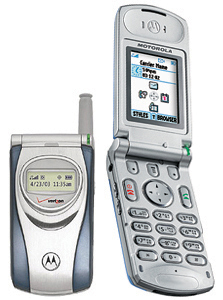 The Motorola T731 is a new CDMA model that is essentially the sister phone of the GSM T720. It has many of the same features, but with virtually nothing new except for a color screen, it is basically a V60c in a new package. Let me justify that remark by saying that I couldn’t find all that much in the T731 that wasn’t already in the V60c and V60ci models. The menus were the same, the feature set was the same, and overall functionality was the same. The only feature that makes the T731 even worth considering is the big color screen, and support for low-res background images. There has been considerable discussion concerning the build quality of this model, but the ones I've had a chance to play with seemed to be quite solidly constructed. They had a solid feel when squeezed, the fit-and-finish were great, and the flip had little or no play, and it didn’t creak unless I put an insane amount of pressure on the hinge (which isn’t a good idea anyway). It certainly seemed to be markedly more solid than the V60 models. As for the color screen, it was a bit of a disappointment. It wasn’t particularly bright, and the colors seemed washed-out. I’ve personally seen far better color screens on other phones I’ve tested recently. To its credit, it is actually visible in direct sunlight, though not as brilliant as the screen on the Siemens SL55. Unfortunately it still needs the backlight when outdoors if the sun isn’t shining directly on it. Adjusting the earpiece volume was a bit of a pain. Although it has side-mounted volume buttons, they are flush with the side and there is no tactile feel. It is therefore impossible to tell if you are pressing the up or down volume buttons (assuming you can located them in the first place). Motorola has wisely done away with the joke of an antenna that appeared on various V60 and V120 models. The T731 has a full-length pull-up antenna that also retracts neatly without leaving a big stub sticking up that is easy to break off. Although pull-up antennas aren't usually necessary when operating at 1900 MHz, I found that the T731 needed its antenna up to provided the least number of frame errors. However, it was nice to see that they added an option to treat the phonebook the same way as their iDEN phones. This means you can restrict the summary list to just one entry per name instead of an individual entry for each stored number, even if it had the same name as another. While the phonebook is still quite primitive compared to what other companies offer, this was at least a step in the right direction. Response time on the menus wasn't the greatest. I found that the phone felt oddly sluggish, though it certainly wasn't a huge problem. This has been an issue with Motorola phones going back quite some time, as even the P280 has problems with this. RF performance was quite good, but not stellar like the Ericsson T206 or Nokia 3586i. It performed a bit better than my old ST-7868W with a stubby antenna, a phone which I consider to have average to above-average RF performance. However, the T731 isn’t markedly better, and so I would say that it has slightly above average RF sensitivity. Incoming sound quality is a mixed bag. While sound reproduction was excellent (perhaps the best I’ve heard so far on a CDMA phone), its tonal balance was rather disappointing. Just like the T720 I had a chance to try quickly, the T731 sounds hollow and a bit boomy. It wasn’t that bad however, and even picky users such as me will likely get used to it over time. Slightly poor tonal balance is preferable to poor sound reproduction (yes, I’m referring to the Nokia 3586i). Earpiece volume wasn’t especially loud, but it was more than acceptable. Unfortunately the sweet spot on the earpiece is very hard to locate, and like the V60c before it the T731 tends to get muddier-sounding the closer you get to that sweet spot. Outgoing sound quality was perhaps the best of any 1X phone I’ve so far tried. Because of the close proximity of the microphone to the user’s mouth, the sensitivity of that microphone was kept to a minimum. This means that it picks up far less background noise, and therefore it doesn’t trigger that horrendous noise cancellation feature in the EVRC CODEC anywhere near as easily as other 1X phones. However, once the background noise gets loud enough, the effects are essentially the same, since there was no way that Motorola could avoid this. So in summary, the T731 could do with a bit more refinement. It could use somewhat better tonal balance, improvements to the menu system, and a little more RF sensitivity. Aside from that however, I’d have to say that the T731 is the best Telus phone I’ve tested in quite some time. Because it beats the Ericsson T206 hands down in outgoing sound quality, I would personally prefer to have a T731 than a T206 for day-to-day use.